We operate entirely by donation. Your generosity feeds and houses the nuns, sustaining all their activities: Dharma talks, bringing the Dharma to myriad situations such as hospice programs and interfaith seminars, pop up meditation sessions in parks and city spaces, family counseling and rituals for transitions. You also enable an annual donation for our sister nuns in India. For US citizens: All donations to Vajra Dakini Nunnery are tax deductible. “Quan Yin” is a sculptural expression of compassion that Khenmo Drolma created while she was being treated for cancer in 1993. (Khenmo was an esteemed Professor of Sculpture at the University of Maine and at the Maine College of Art in Portland, ME before becoming a Buddhist nun. Throughout her distinguished academic career, she received numerous awards and prizes. Traditionally Qyan Yin, the deity of compassion, has 1000 arms and holds medicine that is needed in her hands. 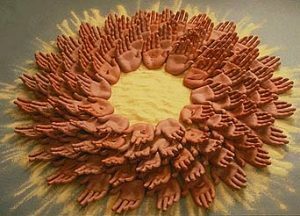 Khenmo’s vision is that in community, we each become one of her hands. Now Khenmo’s sculpture, Quan Yin, having been exhibited in US museums, is being offered to support our new nuns residence in Portland. 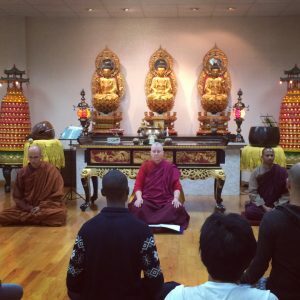 Honor someone you think embodies compassion and kindness with a donation of $100 or more for the Vajra Dakini Nuns’ Residence. 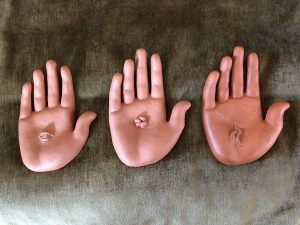 You or your friend will receive one of the original 100 ceramic hands from this sculpture, along with a description of Quan Yin. A few of the hands hold symbols of healing medicines such as seeds, water, a bear claw, stars and as in the tradition, an eye. These can be requested as long as they are available. Use the form below to donate a contribution through paypal (choose your level of support) Enter your mailing address (or other recipient) in paypal and any additional information, personal note or dedication from you. Or you can send a check and the information to Vajra Dakini Nunnery at the address below. These donations will support the new nuns Residence in Portland, Maine. The sculpture should arrive within 30 days. Please add $20 mailing fee if you are outside the US.